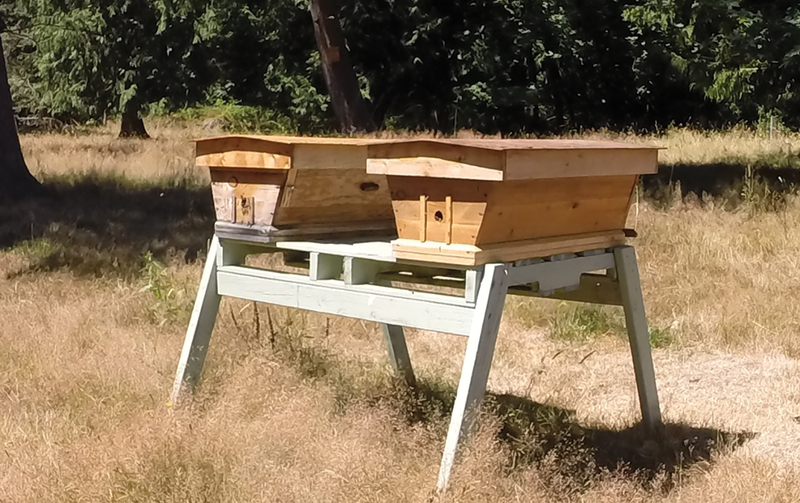 Three of my regular Warre hives in the field, one custom design Warre and Langstroth hive on the stand. Since this apiary is across the street from my house in my neighbor’s back acreage the yellow wagon is my equipment transporter. 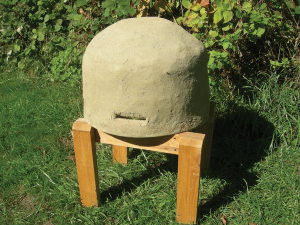 A multi-style hive apiary is pretty much what it sounds like. I keep bees in Langstroth, Top Bar and Warre hives. 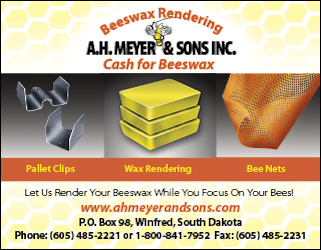 I have been truly blessed to have lived for over 35 years in a location that is conducive with my passion of bees. My neighborhood and surrounding countryside is rural small acreage farms and homes. We are a friendly community and one of the things that brings several of the families together is being in the exclusive club of having “Ernie’s hives” on their farm. I have small apiaries on neighbor’s farms and scattered hives on my five acre farm. I’ve named the apiaries Warre Town, Langsville and Top Bar Hill. I would like to say they are all neatly arranged as Top Bars in one apiary, Langstroths in an another and Warres in another but they’re not. I’m not quite that fastidious as a beekeeper. A different style hive is at times sprinkled into a different apiary. I am however a bit of a perfectionist with my second passion, building bee hives. As an accomplished wood worker with a large workshop I build nearly all of my woodenware. From conventional hive design to designing hives- I have build mainstream and experimental hives. I have even crafted an historically accurate skep hive. 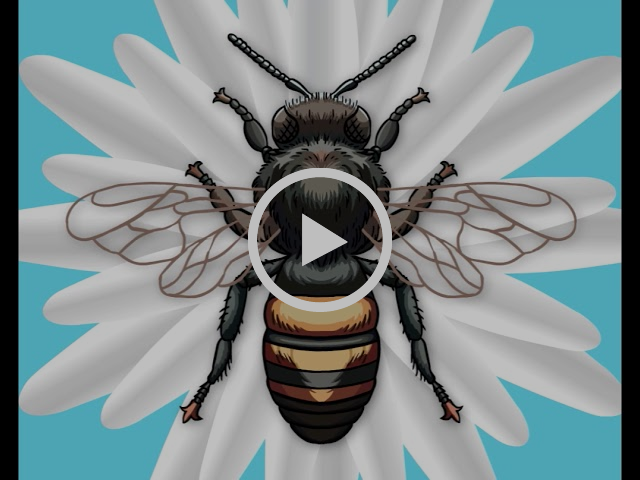 One of the first questions I am usually asked is, “Why do you keep bees in different styles of hives?” My short answer is pretty simple, “I love bees.” Looking back on my beekeeping career, I realized early on that my focus was on the bees themselves. I am fascinated by bees. I am not just passionate about bees, I am obsessed about bees. My number one focus for keeping bees is keeping them alive, everything else is secondary. The particular kind of hive I keep them in or the harvesting of any products from them is not that important to me. That’s not to say I don’t have the opportunity to harvest honey and render wax. It’s that I don’t intentionally focus on managing my hives for production. Keeping bees is pointless to me if I can’t keep them alive. I have no biases for or against a specific hive or management style. If there are bees in any manner of hive, I am open mindedly interested. This mind set makes me a excellent candidate to honestly approach the value of any style of hive and management for the health of bees. I have been studying the bees in different styles of hives to see if hive style can make a valid difference in colony health and longevity based on the hive style and management method. I do work to master the established intended methods for managing the bees in each particular style of hive. However I will experiment with minor modifications in the construction of the hives and methods of managing them. 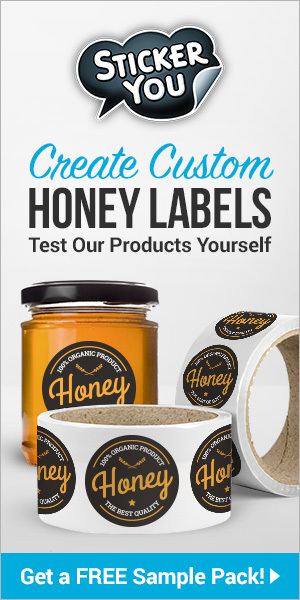 Nearly everything I test and experiment with is focused on bee health and well being. One aspect I focus on in my research is how easy can I make it for the keeper to provide any new bee beneficial idea to bees I come up with. In other words, I try hard not to over think or over engineer anything. Sometimes a subtle change can make a big difference. The best way to start an explanation of the differences in these three hives is to quote the famous beekeeper, F.E. Moeller. I cannot think of a better explanation of what we do as beekeepers then that and in one sentence! The biggest difference between each style of hive is it’s purpose and style of management. The fact that the “box” the bees live in looks different is really secondary. To decide if you want to keep bees in any particular style of hive, you don’t compare one hive style to another. You compare the intended management style and purpose of each hive to your personal management style and your expectations from the bees. Bee keeper personality styles are as important as hive style to understand in relation to making choices. Making a wrong choice of hive style that has a different purpose and management method then the keeper is expecting can become frustrating and disappointing for the keeper. Each style of hive has a specific method of management that may or may not be compatible to the keeper’s style. The bees will live happily in nearly any kind of cavity they find suitable. A keeper not liking the style of a hive because it doesn’t produce the results from the bees that he expects, doesn’t make it a wrong hive. It only makes that style of hive for that particular keeper a wrong choice of hive. The right hive style choice is a marriage of three things. The management style for- “facilitating normal biological colony changes” -that matches the keeper’s personality style. The intended purpose of the hive. The keeper’s expectations for keeping bees. The closer those three things line up, the happier the keeper will be with their chosen hive style. 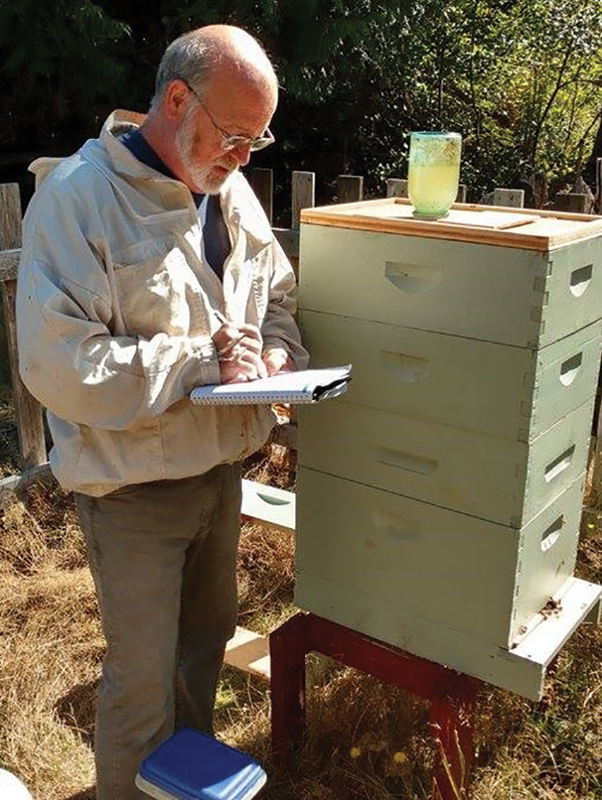 Author working with one of his Langstroth hives. Rev. Lorenzo Lorraine Langstroth developed the Langstroth hive in 18521. 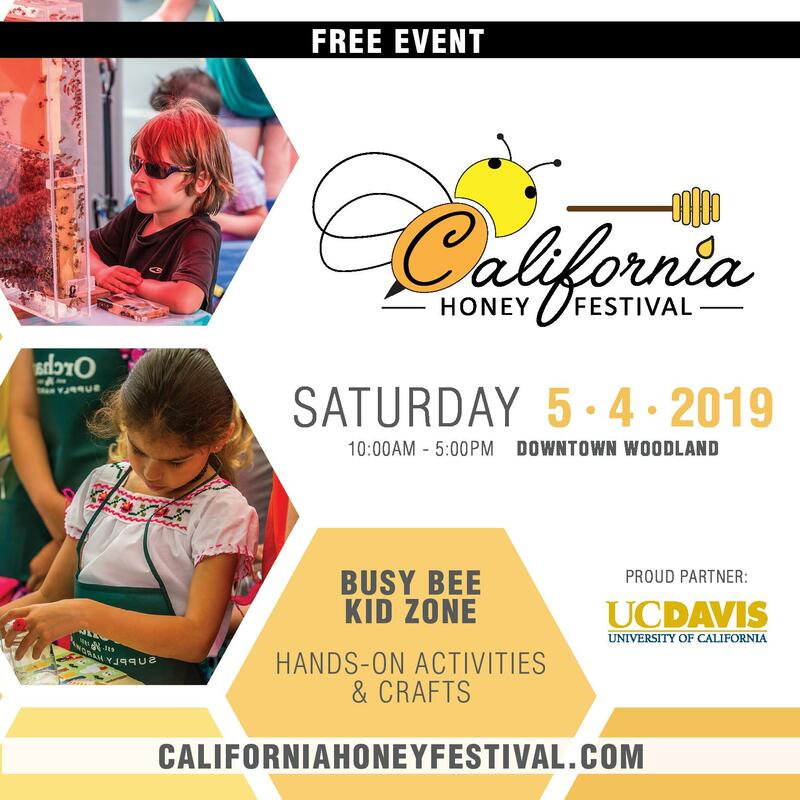 He saw honey as a resource and the honey bee colonies as little natural industrialized societies that, with the proper habitat or “factory”, could produce a large amount of products for humans. He saw the bee hive as an industrial factory and the apiary as an industrial complex. The hive and management style he developed, much like a factory, focused on a maximum level of production in the easiest way possible. 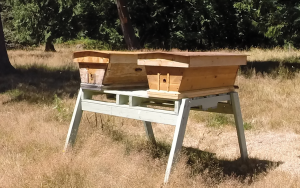 The Langstroth requires a higher level of management than the Warre or Top Bar hive, but produces a higher level of products then the other two styles of hive. The Warre type hive has deep past, predating the Langstroth style2. Working with hive designs dating back to the 1700s Abbe’ Emile Warre developed the modern Warre hive and management in the early 1900s. He wanted a hive that incorporated a happy medium of the bee’s natural world and the keeper’s desire for products from the hive. Emile called his hive The People’s Hive. He developed it for the homesteader farmers in France. A simple hive to build and manage, it’s design and simple management style mimics the normal biological colony changes of the bees in natural hollow tree cavities. His simple objective was “Happy Bees, Happy Beekeepers.” Requires less management, reflecting in less hive product return. 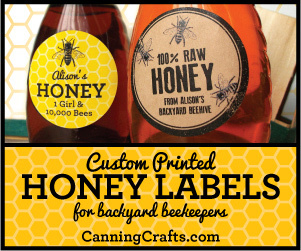 Bees are more like “pets” then product-producing livestock. Two of my Top Bar hives. The stand is a repurposed pallet. The Top Bar hive has the “deepest” past with versions of it being mentioned as far back as ancient Egypt3. During an era of skeps, clay tubes, and hollow logs, versions of top bar styles began to appear as methods of managing hives without struggling with fixed combs. 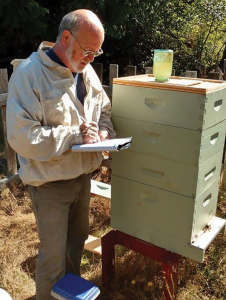 Credit for the present day Kenyan Top Bar hive seems to go to Dr. Maurice Smith of Canada who developed today’s sloped sided version of the hive in the early 1970s. This hive is managed horizontally, in a single box, and by a single bar at a time. This hive needs less management then a Langstroth but a bit more than a Warre. 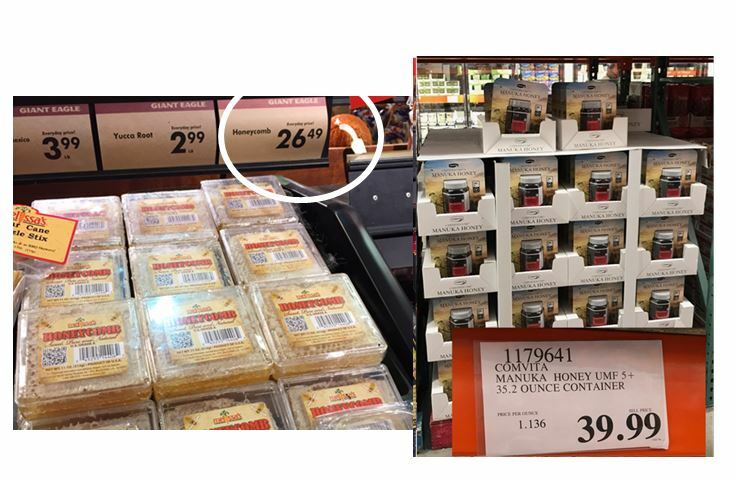 As with the Warre, requiring less management produces less hive products than the Langstroth. Hand woven from Canary Straw Grass and covered with Cloam. Cloam is the original covering historically used to cover skeps in Europe. It is made of a cow manure,clay,and wood ash mixture. Very hard and relatively water proof. Has a tight schedule. Makes a living with the bees. Much of the management methods involves timing normal biological colony changes with business interests. Desires maximum achievable product production from the bees. Will alter natural colony behavior to obtain keeper desired results. In this industrial style the hive is managed for maximum colony size and hive production output. The Langstroth hive will serve this personality well. A keeper doesn’t have to chose one exact personality over another. I find myself, at one time or another, having a combination or blending of all three. Even then, I tend to lean more towards a Facilitator and Observer then a Controller. This is mainly a basic personality style description to help a keeper choose a hive type most complimentary to their keeping style. 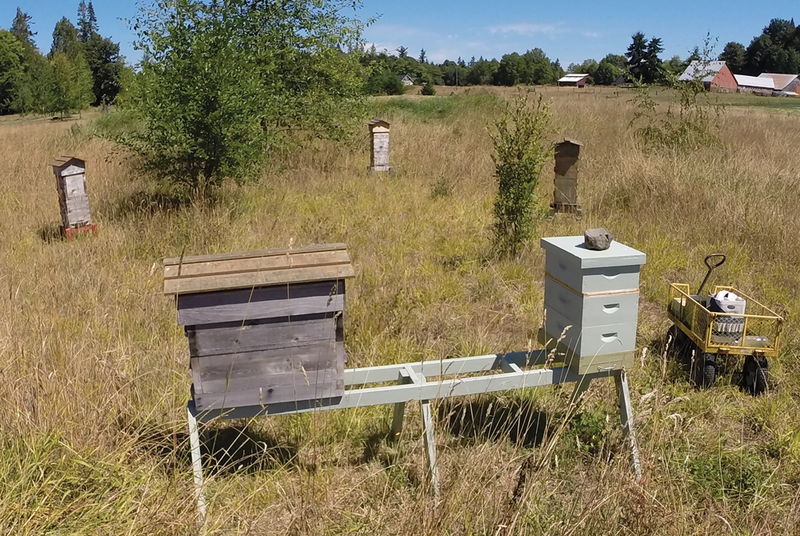 If a keeper understands that the three styles of hives have different management methods, expectations, and results and they have a compatible management style for each one – then running a multi-hive style apiary can be quite enjoyable. Does a particular hive style make a valid difference in colony health and longevity based on the hive style alone? The short answer – no. In today’s beekeeping it is short sighted to believe that a colony will be trouble free based on just the style of hive they are put in. Colony health and longevity is a condition that must be managed by the keeper regardless of the hive style the bees are kept in. The method of management may differ somewhat from one style of hive to the other but it still requires the beekeeper to be a manager of the colony’s health. In my research the management has a far greater effect on maintaining the health and longevity of a colony then a particular hive style. 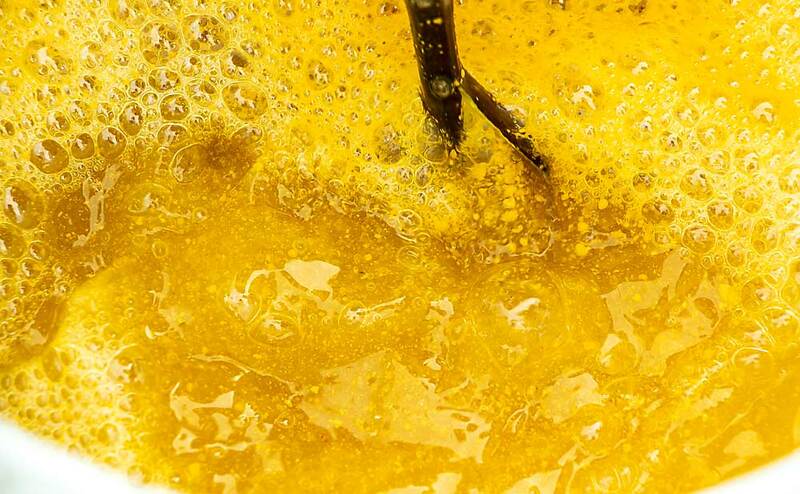 Proper management and attention, applicable to the specific hive style more then anything else leads to good results. Mismanagement or neglect will produce disappointing results regardless of the hive style. 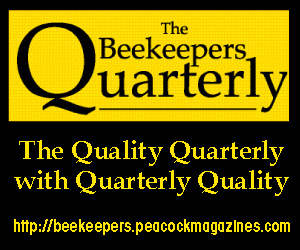 I am a member of the Olympia Beekeeping Association, a local club with over 250 members. Many members are Alterative hive keepers. We even have native pollinator expert member. 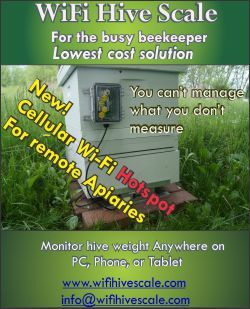 I am also a mentor for many of the new members wanting to start Warre and Top Bar hives. My advice for new Alternative hive keepers revolves around this personal philosophy; “A keeper needs a greater knowledge of bees to manage them less”. Some styles of hives may require less management but in my experience it requires a firm knowledge of keeping bees to be the most successful. 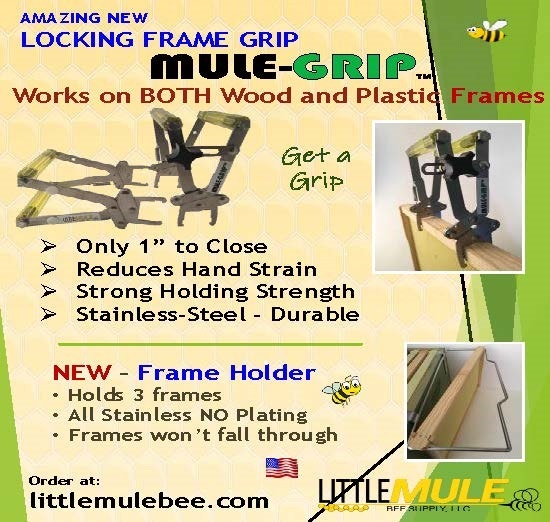 A recommendation, especially for first time beekeepers. If you are going to start a Top Bar or Warre hive, start a Langstroth also. The first year is the steepest part of the learning curve in beekeeping. It is far easier to learn that “greater knowledge of bees” managing a Langstroth hive along with their chosen Alternative hive. Nearly everything you learn about keeping bees in a Langstroth will apply in an Alternative hive. 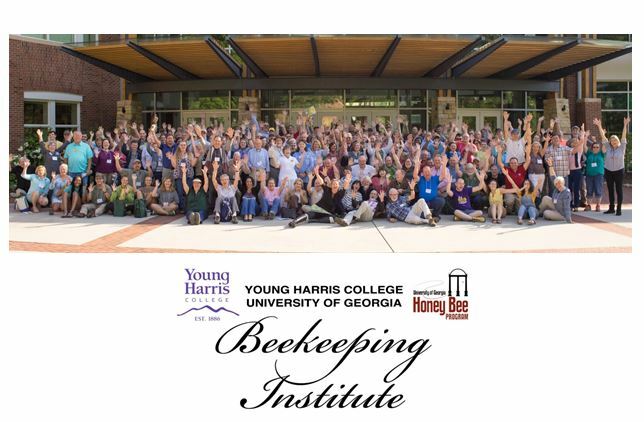 Access to mentors and club members for help and assistance is essential on the path to successful beekeeping. Many clubs may not have Alternative keepers available to help and mentor so the much of the reliable help will come from keepers of Langstroths. An example of how this would work is to ask a Langstroth keeper for help installing a package in your Langstroth. Then using what you have learned, install a package in your Top Bar or Warre. I would bet that most clubs have a member willing to help you with the Langstroth and then would want to get involved in installing the other package with you. 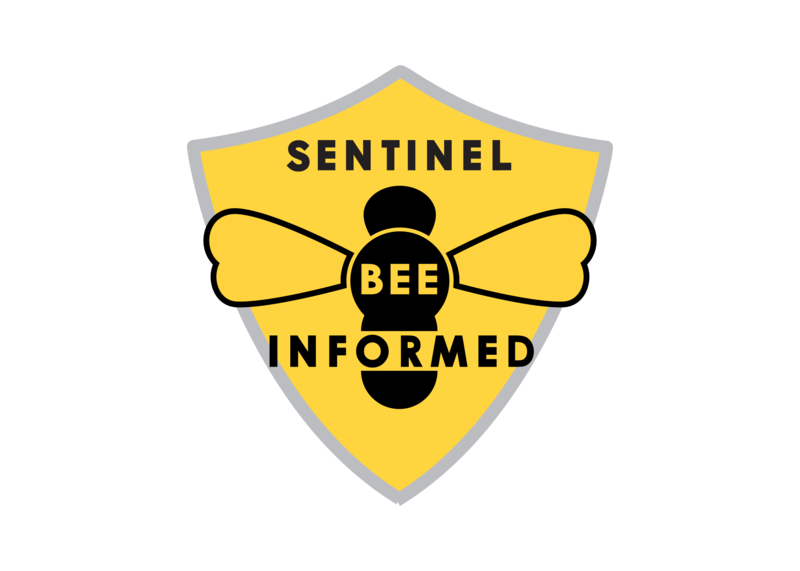 Another example would be asking a club member, “I installed a package in my Langstroth, what do I do now?” Just about everything they say to do will apply to your Alternative hive also. 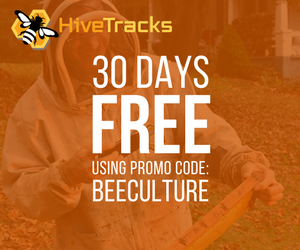 Beekeepers using any hive style or management method have far more in common then not. 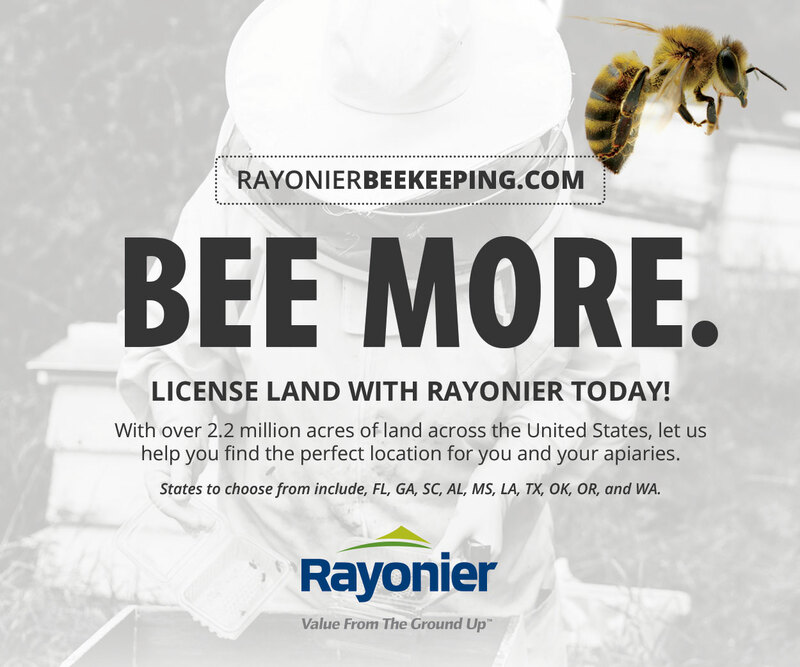 Beekeepers – regardless of hive design, management style, intention for the bees, or philosophy of beekeeping, all have one strong common bond- the sharing of their passion for the honey bee. 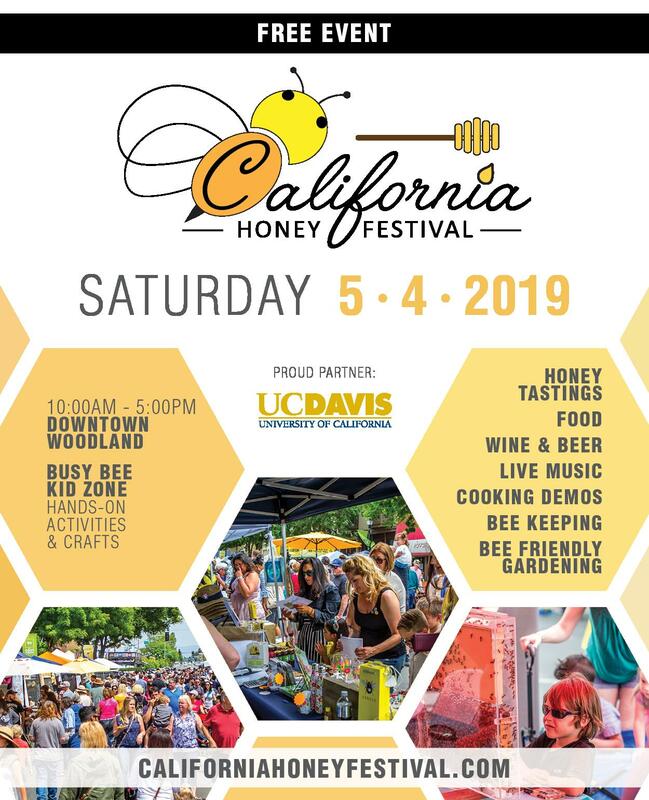 CATCH THE BUZZ – I’m in the wrong Business!! !